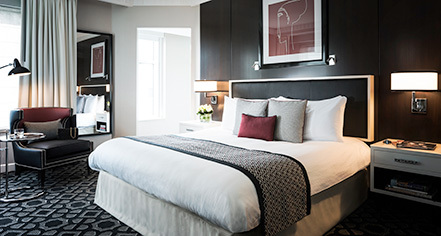 Sofitel Washington DC Lafayette Square provides stunning guestrooms and suites with the most exquisite experience and comfort, from the delicate furnishings to the vibrant artwork. Effortlessly blending Art Deco with a chic, modern look, the Sofitel offers elegant class, international flair, and sumptuous coziness. Completing the experience is the Sofitel’s own luxurious feathertop bed and duvet sleep system, the SoBed™. The Superior Room at Sofitel Washington DC Lafayette Square has one king-size or two double-size beds in 370-400 square feet. Connecting rooms are available upon request. At 400-450 square feet, the Luxury Room contains one king-size or two double-size beds, a large working area, and a gorgeous view of the city. Extra bedding available upon request at an extra cost. 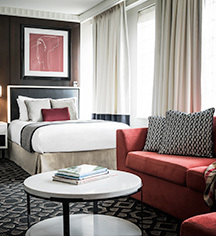 The Junior Suite Executive is tastefully decorated in neutral tones and accented by red velvet, with black and white photos of the hotel's inspirations in Paris and DC. The spacious bedroom provides one king-size bed, two 55-inch HDTVs, a separate sitting area with a pull-out sofa bed, and coffee and tea amenities; all in 426-475 square feet. The stylish Parisian-inspired Prestige Suite at Sofitel is spacious, decorated with red velvet and original paintings. It features a king-size bed, separate living room with a large desk for any business needs, two 55-inch HDTVs, and coffee and tea amenities in 600 square feet. The regal Presidential Suite provides a private office that seats six, a foyer, Hermes amenities, a half bath for company, a sitting area, dining table for four, two 55-inch HDTVs, a fireplace, premium bar, and an adjoining suite suitable for children or security detail. The oversized master bath contains a soaking tub and a vintage vanity. This considerable suite is 1900 square feet of luxury and comfort.